If you've been here before you already know that my sewing room is swimming in stuff. For those of you who are visiting for the first time I am determined to reduce my excess sewing and crafty things down to a point where I only have projects and items that I really want to spend my creative time on. It's rather challenging for me to get rid of all that 'useful' stuff. I know I'm not the only one who finds it hard, so I'm documenting a lot of the process here, and hopefully that will help me to follow through and encourage others too. Although I have already sorted through some of the excess I estimate I still have about 5 large storage boxes of fabric scraps to go through. In an attempt to be realistic about what I can actually keep in my sewing room I've decided that I should part with my calico scraps. I use my calico scraps a lot. Far more then any of my other fabric scraps. I use them so much I came up with this list on the spot, a few more minutes and I'm sure I could double it. But I also have to consider this list. I don't have room for them. The more I sew the more scraps there will be. There will always be more. I have lots of other fabric scraps, it's not like I won't have something to use if needed. Fabric scraps take up more room then a roll of calico. A new roll of calico is reasonably affordable. 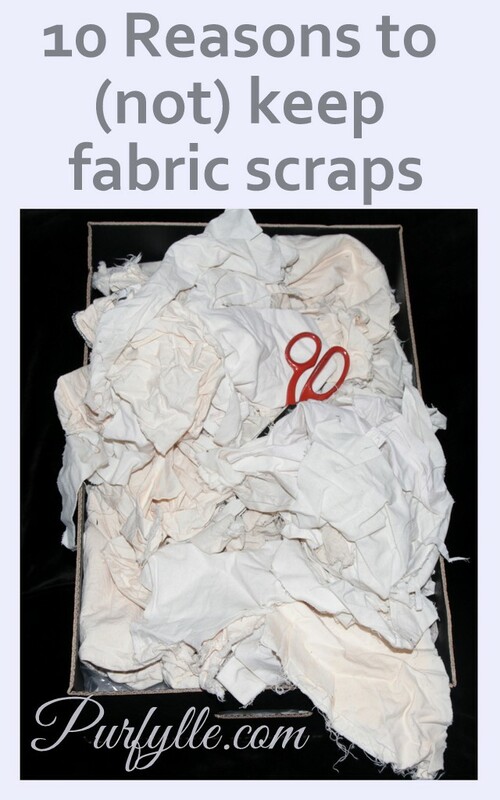 Scraps are less useful then a roll of fabric. Calico is never out of stock at the fabric store. Nobody needs that much scrap fabric. It is extremely doubtful I would use all those scraps in the next year. Well that's a start. These scraps may not have left the house but they are no longer in my sewing room and that is progress! What do you use fabric scraps for? I use mine for quilts. I have problems letting the scraps go, even a small piece...thinking I may use it for applique or I may start quilting! But the reason #9 is so true...very unlikely that I will use them next year! It used to make sense to hold onto my scraps, but the volume got too large. I had to do something! If I were a quilter I think it would be even harder to let them go. This is where "the container is the limit" is useful. Scraps are definitely useful but you don't need to keep all of them. Think about how much scrapage you would need at one time and how much new scrapage occurs with new projects. Then pick a container (space on shelf, box, bag, drawer, whatever) that holds just that amount of scraps. As you make new scraps, you can keep them if they fit, otherwise you have to toss some to make room. Kelly your are so right. I had a container for calico scraps but it's been downsized. As for all the other scraps, I'm not going to keep them once a project is finished and a part of that is actually finishing projects or getting rid of them if I'm never going to finish them. hmmm well if the goal is to get them out of the craft room, then hubby taking them to the shed works! I am starting to accumulate quite a stash of scraps and unfortunately no idea what to do with them but as my yarn stash is dwindling, i still have a bit of room - for now. Sigh. So easy to hoard craft supplies!! It is so easy to hoard craft supplies, why is it so hard to kiss them goodbye?